I have traveled to San Diego 3 times in the last 3 years. I keep going back because it’s such a lovely and charming city with great food and low key activities. This time, we flew from Vegas to San Diego a few days after Christmas, and enjoyed three days of fun with our friends Oli, Balkee, and Ryan. The first night we arrived, we went to Nobu in the Gaslamp district. Being die hard Japanese food lovers, Alan and I have been wanting to try Nobu for the longest time, but haven’t had luck with making reservations the last time we were in NYC. In San Diego, reservations were available that very same day! We’re slowly training Bridgette to love Japanese food as well. She usually orders edamame, hand roll of some sort, and Tamago nigiri. It was no different for her at Nobu. I ordered their well known Miso Black Cod, which was absolutely delicious. The fish literally melted in my mouth like butter. Alan had the Omakase (Chef’s Choice) and enjoyed a nice variety of dishes. We were quite satisfied all around! Nobu's famous black cod--nearly melts in your mouth! We had brunch at The Cottage in La Jolla the next day. Alan and I had tried it out the last time we were in San Diego, and we just HAD to go back for their stuffed french toast! While in San Diego, we certainly couldn’t skip Legoland. It was unbelievably crowded though, and we were only able to go on 2 rides. Still, Bridgette thoroughly enjoyed it! Thanks for the family pic Balkee! We waited nearly an hour for this ride. At least they got the front cart! For our last day in San Diego, we decided to go to SeaWorld, and we’re so glad we did. It was actually much more enjoyable than Legoland. Bridgette and her friend Ryan both enjoyed seeing all the animals, and being able to go on rides without waiting forever in line. Photo opp with the penguins! Bridgette’s favorite part of SeaWorld? Face painting! 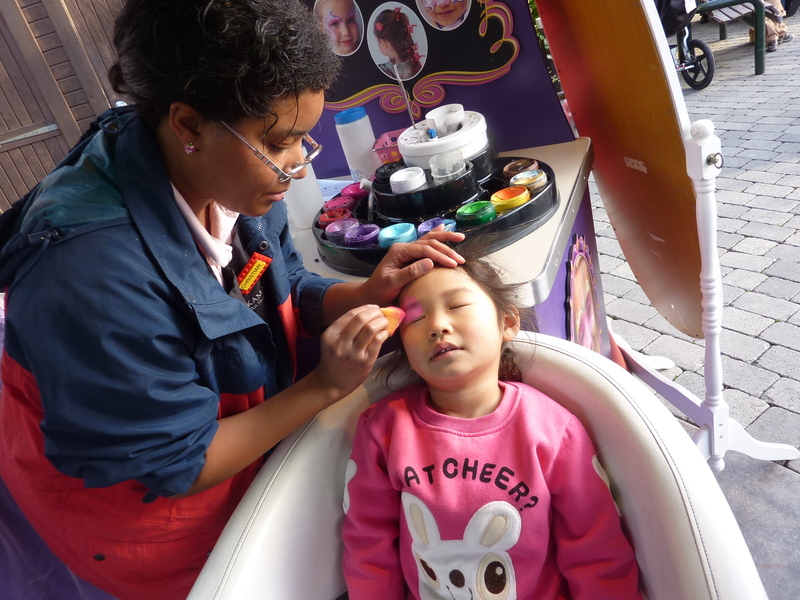 We gifted her a mini-makeover at the face painting booth, and she was super happy with her ‘princess transformation’! Before leaving SeaWorld, we were all excited for the chance to meet Santa in his home, even though Christmas was over!